Halberd or halbert or Swiss voulge vintage engraving. Old engraved illustration of halberd. 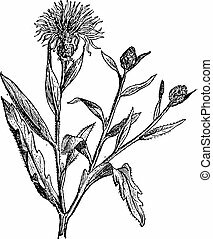 Knapweed or Centaurea or starthistles, vintage engraved illustration. Dictionary of words and things - Larive and Fleury - 1895. 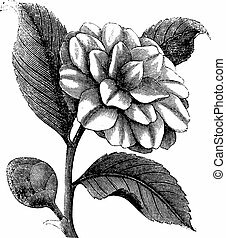 Jasmine or Jasminum, vintage engraved illustration. Dictionary of words and things - Larive and Fleury - 1895. Heliotrope vintage engraving. 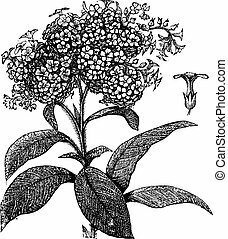 Old engraved illustration of wild heliotrope on white. Witch hazel (Hamamelis virginiana) or winterbloom vintage engraving. 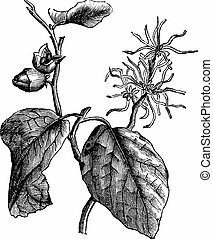 Old engraved illustration of witch hazel leaves and flowers. 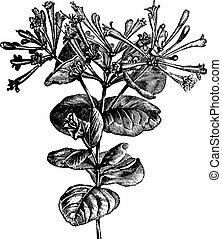 Trumpet Honeysuckle or Lonicera sempervirens, vintage engraving. 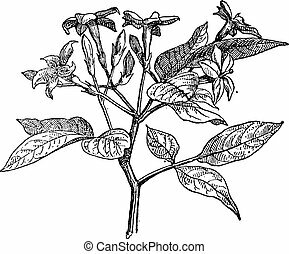 Old engraved illustration of a Trumpet Honeysuckle plant showing flowers. 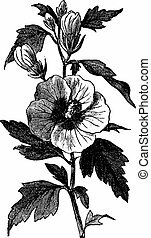 Garden hibiscus (Hibiscus syriacus) or Shrub Althea or Rose of Sharon or Rose Althea vintage engraving. Old engraved illustration of Hibiscus syriacus. 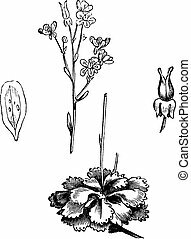 Shadow Saxifrage (Saxifraga umbrosa), vintage engraved illustration.Trousset encyclopedia (1886 - 1891). 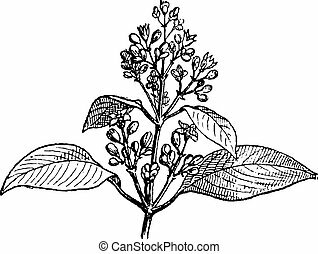 Sandalwood leaves and buds, vintage engraved illustration. Dictionary of words and things - Larive and Fleury - 1895.